Glenn Ford and William Holden go toe to toe in this notable western from 1948. 1948's The Man From Colorado marks, to my knowledge, the second and final team-up of Glenn Ford and William Holden on the silver screen. They'd both appeared in another western 7 years earlier, 1941's Texas, a breezy little film that doesn't quite walk the line between drama and comedy as easily as it wishes it did. In Texas, they'd had a remarkable chemistry that stemmed from a real-life friendship developed despite the intentions of Harry Cohn, the head of Columbia Pictures; Cohn had hired them at the same time with the belief that they'd see each other as competition, thus working harder for the studio in fear of losing roles to each other. 1941's Texas found the two young actors starring as scruffy outcasts, upstarts looking for a break. 1948's The Man from Colorado finds the two actors boys no more, but grown men. One need not look very far to discover why: in the years since their first screen appearance together, World War II had plunged America into global conflict and both men had been called upon to serve their country in the Armed Forces. It had only been seven years since Texas, but it might as well have been two decades. The gravity these two men now exhibited on screen reflected the weary nation itself, older, more mature, hopefully wiser, but certainly tired. It's no coincidence that the plot of The Man from Colorado concerns two men after the end of the Civil War. The characters in the film are looking to discover their place in a post-war environment, wondering if the lives they left before their battles still exist in a time of peace. We get two remarkable performances from Ford and Holden, while Ellen Drew plays the woman caught between them. The movie also stars Edgar Buchanan as a character called "Doc," who also appeared with the Ford and Holden in Texas as a character called...you guessed it: "Doc." 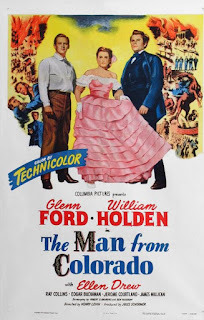 The Man From Colorado has been on DVD for years, but it was recently included in a collection from Mill Creek called "7 Western Showdown," which also includes 1941's Texas and five more westerns, some of which are making their way to DVD for the first time. There appears to be some ever-so-slight degradation of quality due to cramming seven movies onto two DVDs, but they're still highly-watchable and probably look cleaner than they did when they played on theater screens. We're lucky to have these two westerns starring John Ford and William Holden, because their chemistry and talent is apparent throughout.